At the end of 2015, I asked everybody in my social media audience to share their #FoodResolution for 2016. I got a ton of feedback (thank you!) that's already giving me all kinds of ideas for the blog. After sorting through your responses, I thought I'd start out with an easy dish that would appeal to those who are trying to leave takeout behind and cook more often this year. I think it's important for everybody to have some simple staple weeknight dishes that they can bang out without really thinking about it. Weeknight meals are also most often family friendly and inexpensive. Having a variety of basic dinner recipes in your arsenal will help get you into the habit of cooking regularly and eating out less. Today's recipe is one that I learned to cook when I moved out on my own in my early twenties. 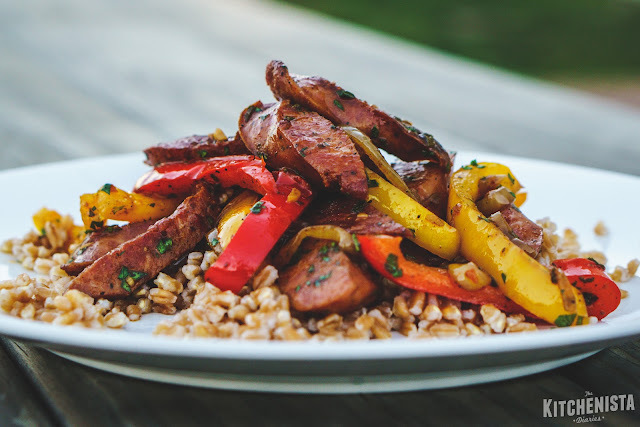 Sausage and peppers is far from the more creative dishes I'd whip up for company, but it's perfect to satisfy my kids and I on regular weekdays. To this day, I still keep smoked sausage in the fridge for those nights that I don't really have time to do more. A meal that's budget friendly, kid friendly and schedule friendly is all win in my world. There's no meat to worry about thawing or marinating or overcooking, no painstaking vegetable prep or custom spice blends to create. We're just talking sausage, onions and peppers folks. You can even choose whether that means pork, beef, chicken or turkey sausage. I've jazzed this up a bit since I first started making it, but it's still a very easy dish to pull together. As written, the recipe serves two generously and was cooked in a 10" skillet. Use a larger skillet if doubling to serve four or more. If all you need is the recipe, continue on below. While this is a really basic dish, I decided to use it as way to drop some gems for beginning home cooks. I try to incorporate cooking tips into all of my recipes, but it's still hard to cover everything all in one post. People often ask me what a good recipe would be to start out with, so I'm looking forward to finally having the perfect one in mind. 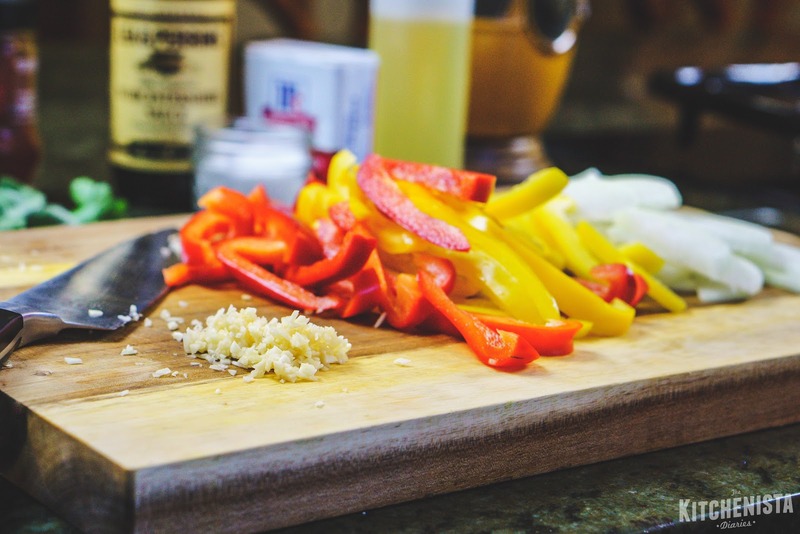 As I started writing, I realized it was a great opportunity to cover some basic building blocks of home cooking. Here are the main concepts you'll see referenced in this recipe. Mise en place: Literally, "everything in its place." This French term is what chefs refer to when getting all of their ingredients, tools and equipment ready to go before cooking. It's a way to ensure you're organized and have everything needed to prepare a recipe. Sear (or Brown): Cooking food over high heat with a little fat browns the surface. It can refer to meat or vegetables. The browning that occurs is a result of the natural sugars in the food caramelizing. Sometimes you'll hear that searing meat locks in its juices. It's been proven that this isn't true, however, browning is a real chemical reaction that creates a change in flavor. It's an important step that shouldn't be skipped. Fond: As you cook, especially after searing meat, little crusty browned bits will develop on the surface of the pan. That's the fond, and it's rich in flavor. It's often used as the starting point for a pan sauce or gravy. Deglaze: Liquid added to the pan helps release the fond, defined above. Often you'll see water, stock or wine added after cooking the meat or vegetables, with instructions to "scrape up the browned bits in the pan." In other dishes, smaller amounts of liquid can naturally work to deglaze a pan, such as the juices released from vegetables as they cook. 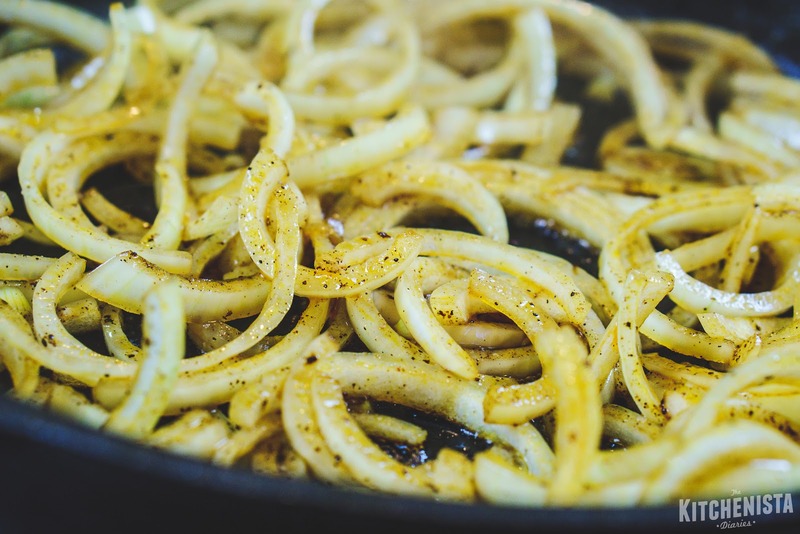 Sauté: When we quickly cook foods over high heat in a little bit of fat, we're sautéing them. What separates this from searing is that the food is constantly moving, and not necessarily browning at all (think crisp tender veggies.) It's important to sauté in a skillet that's large enough to accommodate food in one layer, otherwise moisture gets trapped and you'll wind up steaming it instead. Salt to Taste: In most recipes, there's not an exact amount of salt that could ever be given to the home cook. Besides variations in the type of salt used, the taste of your ingredients are going to be slightly different every time. This requires you to season accordingly and make adjustments based on what you personally determine a dish needs. A pinch of salt is what can be grabbed between your thumb and forefinger; no more than an 1/8th of a teaspoon at a time. In almost all of my recipes, I use Kosher salt, but sometimes I'll specify sea salt. Balancing flavors: Technically, our tastebuds can only detect sweetness, saltiness, sourness, bitterness and umami. 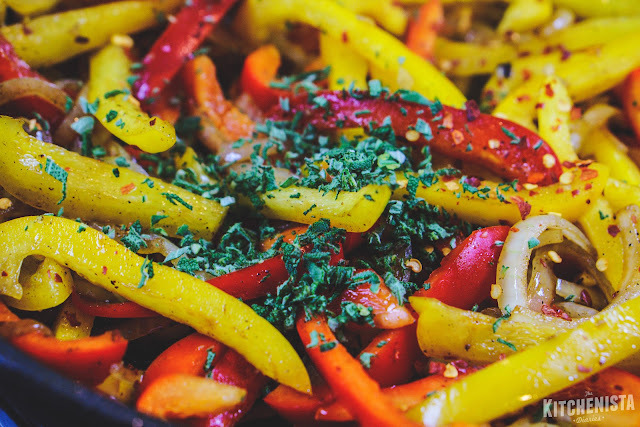 Flavors incorporate even more of a sensory experience, such as aroma, emotion and mouthfeel; think spiciness or fruitiness among others. A good dish will hit a variety of notes in a way that's thoughtfully composed. (The brilliance in doing so is what separates average cooks from the exceptionally gifted.) Some flavors will be deep and lingering, like the savoriness from the meat in your dish. Others may be punches of flavor here and there, like that from a bright herb, hot chile pepper, or splash of citrus juice. Think of it as taking your tastebuds on a ride. Rather than coasting along a flat, boring road, you'd want some low points and high points along the way to make things interesting. The first habit you should develop in the kitchen is mise en place. I talk about this often and for good reason; organization is such a crucial aspect of home cooking. For me, taking a few minutes to collect my ingredients and equipment is also the time I need to let everything else on my mind go and focus on the task at hand. You won't always need to physically prep every ingredient before beginning. That will depend on how quickly the recipe moves. For this one, you'll have time to slice your onion and peppers later, so the sausage is the only thing I prep ahead of time. 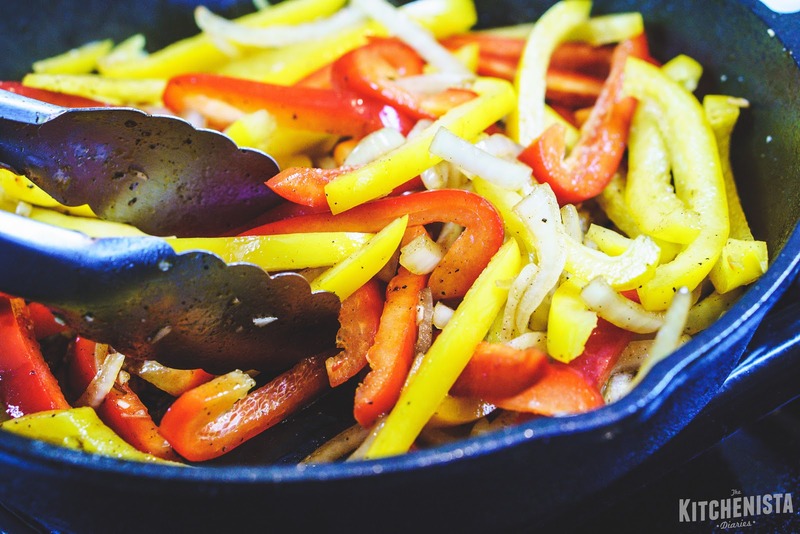 Preheat your skillet over medium high heat while you get things together. The sausage simply needs to be sliced (rounds or half moon shapes will suffice.) 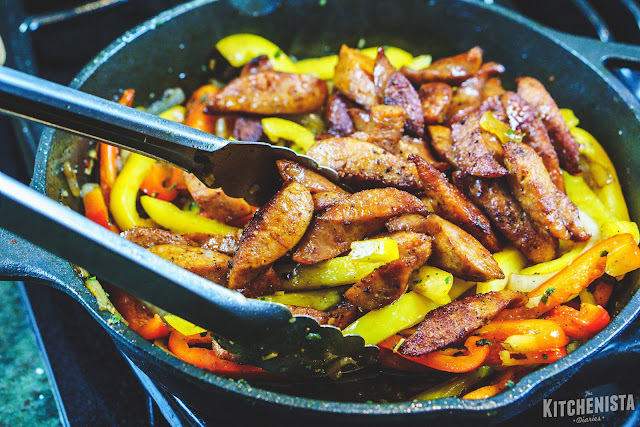 Add oil to coat your hot skillet, wait a minute for it to heat and then add the sausage. Every couple minutes, toss the sausage around to sear all sides. 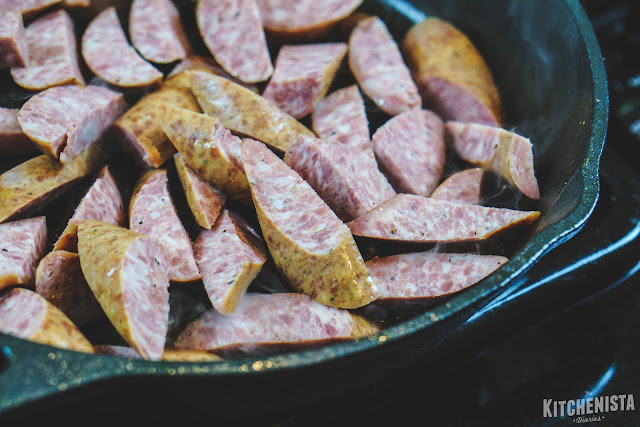 Smoked sausage is already fully cooked, but you're looking for it to caramelize and develop crusty surfaces. Browning adds flavor to the dish and improves the texture of the sausage. This will take about six to eight minutes. 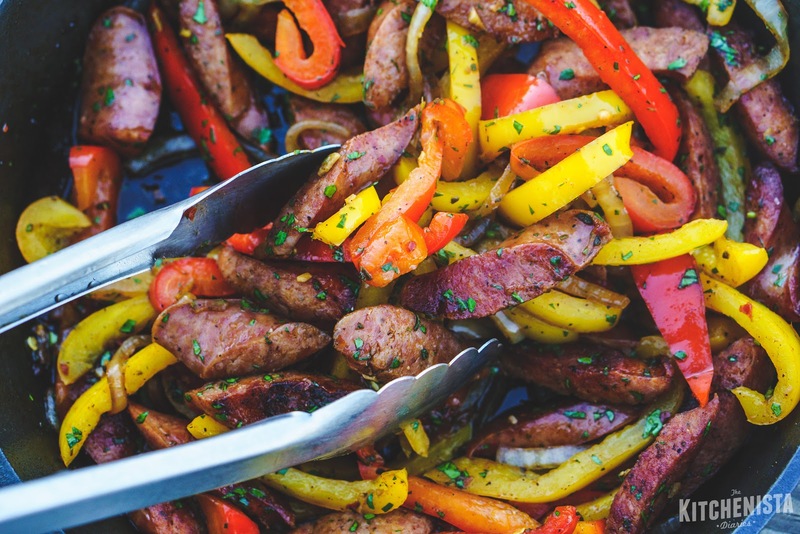 If your sausage has a higher sugar content, keep a closer eye on it so as not to burn anything, and you may want to turn the heat down towards the end. Once the sausage is nicely browned, I add the smoked paprika for a boost in flavor and color. 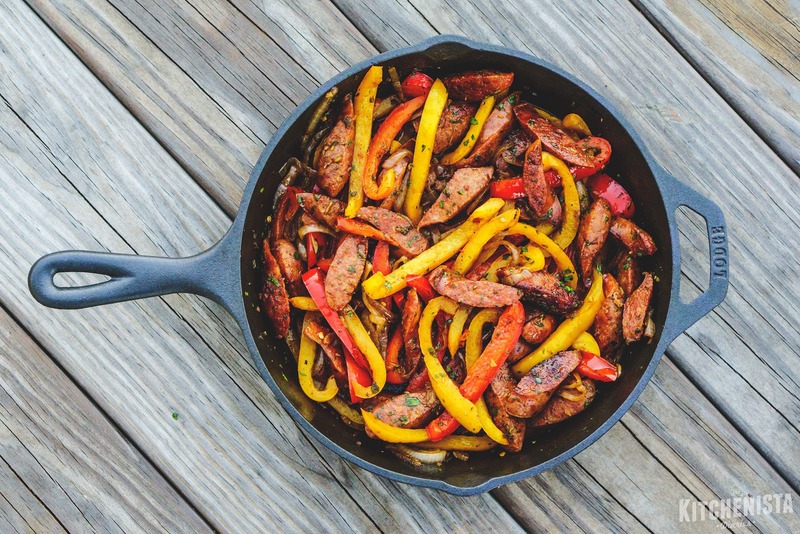 (If you are using a boldly or uniquely seasoned sausage, you may not feel the need to add paprika.) Transfer the browned sausage to a plate and set aside. Meanwhile, multi-task by slicing the peppers and onions and chopping garlic, all while the sausage browns. Just remember to toss the sausage around in the pan every other minute or so. Notice how the onions and peppers are all sliced relatively evenly in size. That ensures everything cooks at the same rate. Red or yellow peppers will be a little sweeter than green but any of them will work. After the sausage is out of the skillet, add the onions. Most smoked sausages will give off enough fat to keep the skillet coated, but if necessary just add a bit more cooking oil. Season the onions with a pinch of salt and pepper. After a few minutes the onions will soften and start to turn translucent. Add the sliced peppers and chopped garlic. By now there's enough moisture in the skillet to prevent garlic from burning in a hot pan, but you should still toss things around a bit every minute or so. Season with a pinch of salt and pepper again. For another boost in flavor, I'll throw in some red pepper flakes for heat and fresh sage, because I love it and it works well with most sausage. 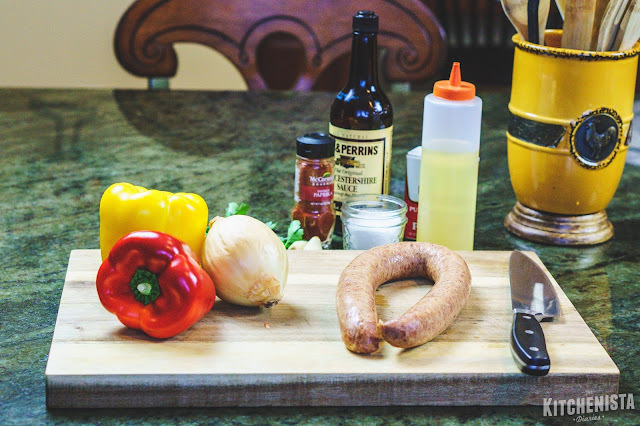 If you have a sausage flavor that you think would take well to a different herb, go for it. Even a healthy pinch of a dried herb mix would work here too. Stir and let things cook down for a few minutes. Once the peppers are soft but still have some bite left (crisp tender as most cooks call it), add a splash of Worcestershire sauce and vinegar and stir in a pat of butter. That final punch of umami, acid and richness just rounds things out and adds a bit of a sauce that will coat the sausage. It also further deglazes the pan, picking up those flavorful browned bits I mentioned earlier. So make sure you use that liquid to help scrape up the bottom of the skillet. 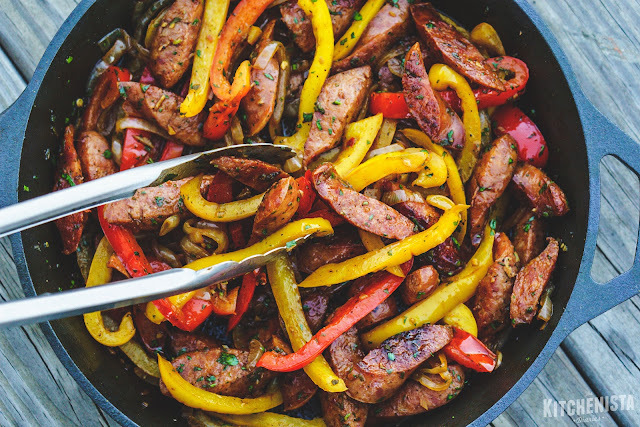 Finally, toss the browned sausage back in with the onions and peppers and let things meld together just long enough to heat the sausage back up. Throw in some chopped parsley for color and freshness, and you're good to go. For those of you who are really taking notes, I'm going to end with a pro tip (and in typical fashion, tell you way more than you probably wanted to know.) Always salt your dishes as you cook, not all at the end. You obviously want the sausage to be properly seasoned, onions to be seasoned and peppers to be seasoned. But more than that, you want to build layers of flavor. Salt draws out some of the moisture from the onions and later the peppers. We're not just talking water though - those juices contain the flavors of the vegetables you cooked. 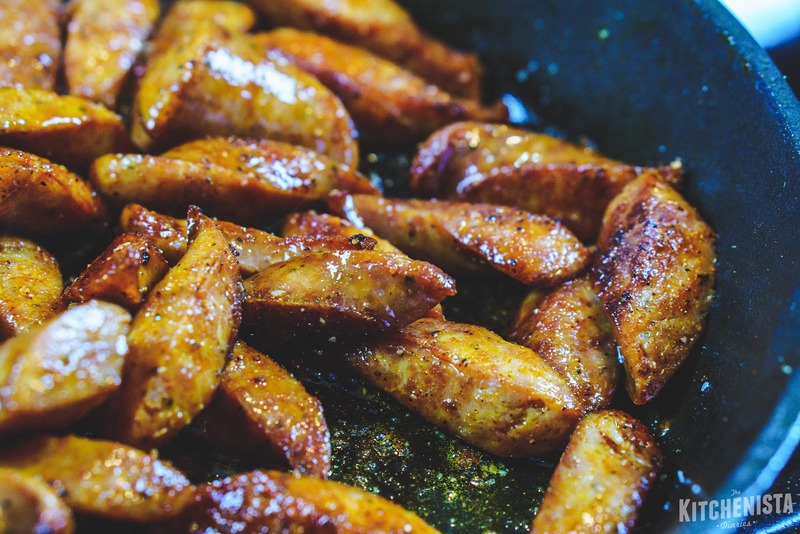 The liquid that collects in the pan, combined with the oils already there, begins to pick up the flavorful browned bits, or fond, left behind from the sausage. 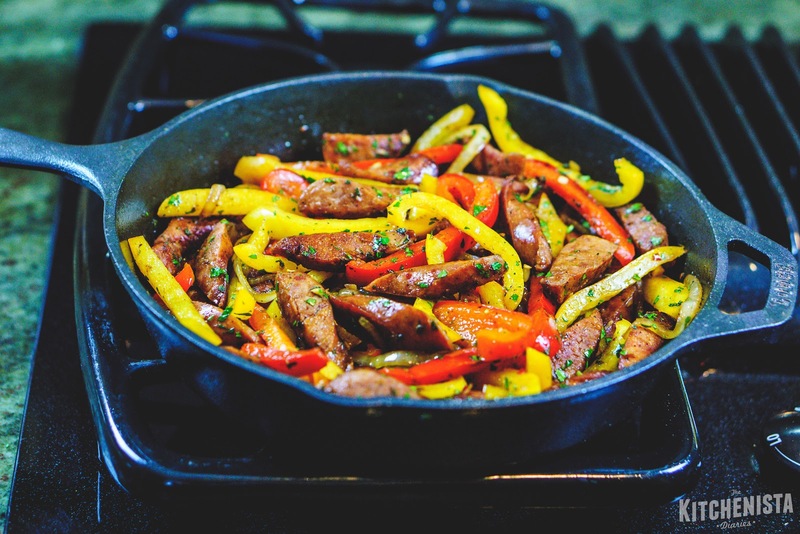 As you add more ingredients to the skillet, such as the garlic, pepper flakes and herbs, those additional flavors also seep into the pan juices. Then you really turn it up with an umami boost from savory Worcestershire sauce, an acidic note from the vinegar and the fatty richness of butter. 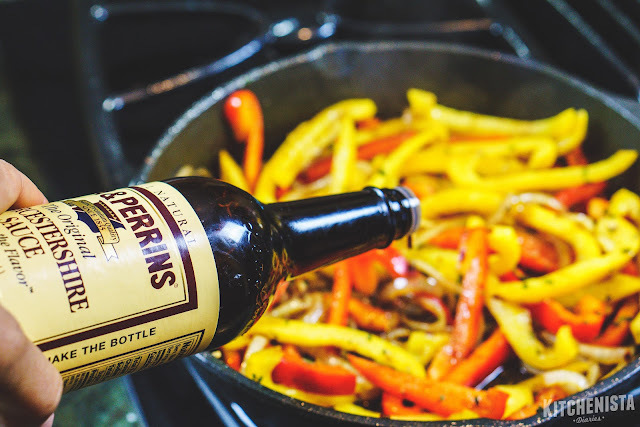 By the time you've finished, the sausage and peppers and onions are all coated with this flavorful saucy liquid. It unifies the dish, marrying all of those components together. That's cooking. It's more than just heating up sausage, peppers and onions in a skillet and calling it a day. You could have taken five minutes to do that all in one step and had something that's totally edible - but would it be great? Probably not. You may never have stopped to think about those things happening in the background while you cook. However, if you make an effort to consciously notice these moving parts with easy dishes, you'll be able to grasp the concept and apply it to more advanced dishes later. My typical accompaniment for sausage and peppers is rice, but lately I've been switching to heartier grains. Today I made a small pot of farro on the side while this cooked. Anything that just needs to simmer for 15 to 20 minutes (or less) is a good, uncomplicated option. Plain or buttered pasta works too, and I'll even admit to Ramen being a guilty pleasure back in the day! Sausage and peppers is a simple meal from my earliest days as a home cook. It's easy to add variety with different sausage flavors and seasonings, or change up the veggies, which makes it a perfect contender to keep in regular rotation without being boring! I hope most especially, that those of you who need some beginner recipes from me will find the #WeeknightKitchenista series helpful. Please feel free to leave a comment with any requests if there are specific dinners you'd like to conquer this year! I just love your new site! I became interested in cooking about a year ago so I always come to your site for inspiration, and your recipes are DELICIOUS! I just got through cooking this dish and it's great! Thank you for this post!